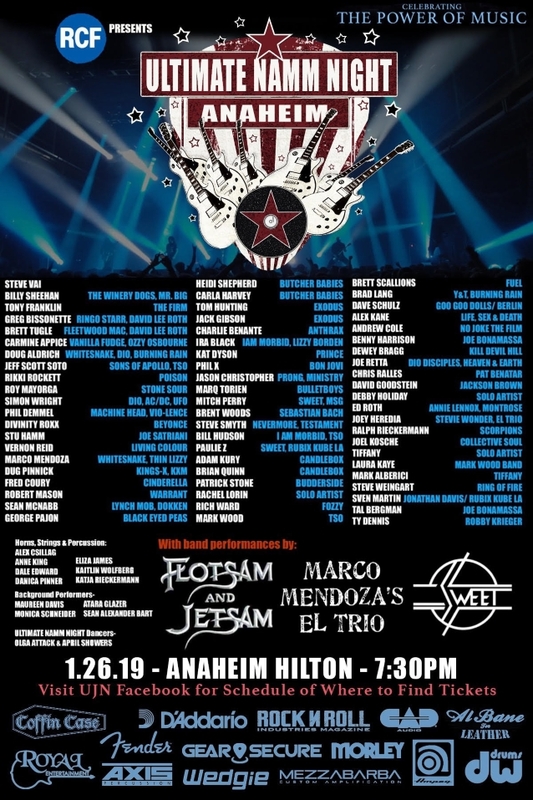 "Ultimate Jam Night", presents its second annual show at NAMM dubbed "Ultimate NAMM Night - The Power Of Music" on Saturday, January 26 at the Hilton Anaheim California Ballroom. The show is sponsored by DW drums, Ampeg, Mezzabara, Morley, Axis, Wedgie, Gear Secure, Coffin Case, CAD, Rock N Roll Industries, Al Bane For Leather, D'Addario, Fender and Royal Entertainment. Included full-band performances by Flotsam And Jetsam, The Sweet and Marco Mendoza's El Trio. Additional performers will be added right up until showtime. As is its custom, the show is offered free of charge, with tickets available at select times during the NAMM convention, details of which can be found on the official Facebook page. 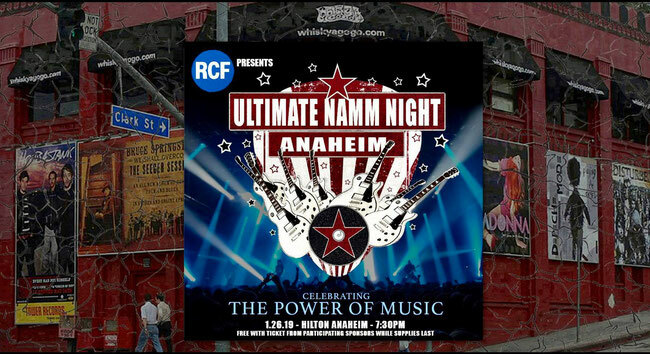 "Ultimate NAMM Night" 2019 is presented by RCF. Founded in 2015 by Chuck Wright (Quiet Riot) "Ultimate Jam Night" is community-oriented event that features live unrehearsed performances by some of music's greatest talent, charitable-giving, comedic interludes, walk-around characters, and other entertainers. It is presented each week free of charge at the famed Whisky A Go Go in Hollywood, California.